It didn't take long to understand why people are talking about these amazing polymer gems! They are non-toxic, bio-degradable and so much fun to play with! It was fun to try to rearrange the colors, but the balls weren't quite cooperating to stay in place for any kind of design! They are round, and bounce, and roll, but so much fun to play with! AND.... the big bin was perfect for adding our feet! After all, these beads/gems are so much fun, you can't just play with them with your hands.... Requests have been made to fill a pool with them :). Needless to say, we are now a part of the BUZZ!!!! 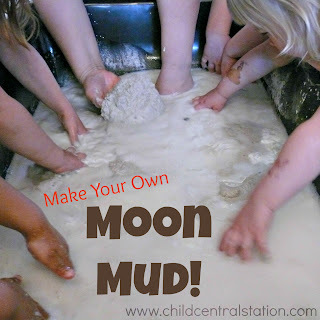 If you haven't tried out these great sensory materials.... they are so worth it! can you tell me how many packages you used to fill the sensory table? I love when kids have the opportunity to experience more than 'enough'. Erin- there are 6 packages of the ones from Walmart in these photos. Lacey- those are exactly what they are. (Well, the clear ones). The ones we left in water have been falling apart, the ones we strained after the 6 hours are still going strong. You need to be careful with these if being used with young children. I bought the ones from the Dollar Tree and on the box is a warning about them containing chemicals that may be harmful. It also said they were intended for ages 12 and up with supervision. I contacted a chemistry teacher who advised me not to allow children to handle them. These particular marbles/beads contained acrylic acid and sodium hydroxide. Both of which can irritate skin especially if the child has any small scratches or cuts. Although I agree they are a great sensory activity they were not originally intended to be used as such....I advise everyone to use them with caution. @ Anonymous, Thank you for the warning. I will look into it closer. The ones I have do not have the warning. They state that they are non-toxic and bio-degradable. There is a choking warning on them, so I am careful if there are young children around. We had fun with those...but they mold in just a day or two. :o( ...and kids were popping them into pieces. One of my co-workers had fun with her children with these this summer with her 4 year olds this summer. I may have to try them, you make them sound like so much fun. Although, I will check the labels first, to make sure I do purchase the non-toxice kind. I enjoyed your photos, and stepping in them does look like wonderful fun. ...and thanks for always sharing such awesome ideas! I have seen these talked about everywhere. I so need to get some. They will be perfect for summer play. I love the way these look and feel, but I am afraid to use them because of the choking hazard. Any thoughts on this? I have used the aqua water beads from Dollar store and after about 4 uses I noticed a bit of mold. We use them with our sensory bottle play and my daughter drops them into a bottle with water. After each use I pour the water from bottle into a strainer and put the water beads back into the container they came in from the store. I took them out today and I noticed mold for sure on one of the beads along with a hint of a brownish color on them. Some looked fine but then I noticed some mold on the bowl that I poured the beads into and on some of the other beads that were on the bottom. At that point I cleaned up my daughter and threw out the beads. Anyone else experience this? And is this normal?? I have used the aqua water beads about 4 uses and today noticed some mold. We use the water beads with a bottle sensory play and my daughter drops them into a bottle of water. After each play I drain the water from the bottle and put the water beads back into the container they originally came in and store them away. I bought ours from the Dollar store. I noticed mold for sure on one bead as I usually pour them into a bowl and I noticed a very slight hint of brown. Finally I saw just a bit of mold on the bowl also and at that point I threw them out and washed up my daughter. Anyone else experience this? Or know why this happens? Is it normal after a few uses? ?